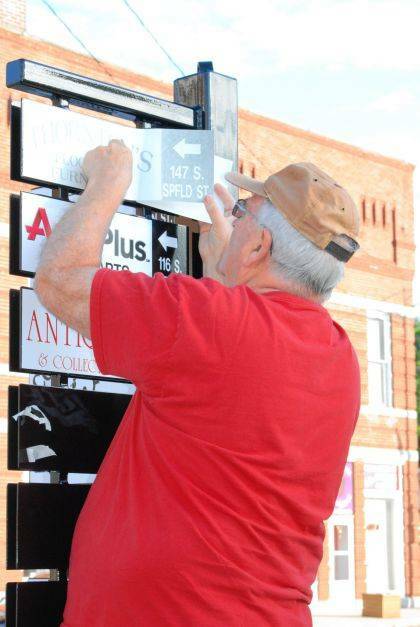 Richard Campbell, owner of Signs of the Times, installs vinyl signs onto steel posts in the village. A display of business signs shows people the way to local shops and cafes. ST. PARIS – New signage in downtown Saint Paris is pointing the way to an array of small shops and cafes within walking distance. Local business owners presented a proposal to the Our Town Saint Paris Business Association in April. 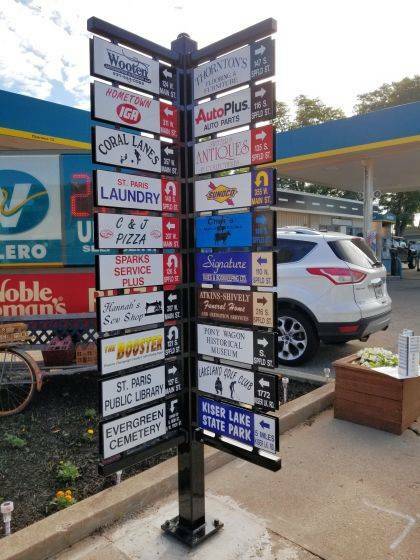 With the approval by the board, the order was placed for metal posts and volunteers began approaching local businesses to purchase space on the post for their signage. The break-away steel posts were manufactured by Charles Sampson, of Sampson Construction Fab. Each of the 40 signs was prepared by local Saint Paris business owner, Richard Campbell, Signs of the Times. The signs were finished just in time for the Champaign County Preservation Alliance’s 26th annual Historic Home & Garden Tour, held this year in the village. “Everyone in the Village was excited to welcome visitors for this event that sold out this year. We have some beautiful historic homes in Saint Paris and the signage added a touch of new to the center of town so that visitors can find their way around with ease,” said Mayor Brenda Cook. The Our Town Saint Paris is a non-profit corporation dedicated to maintaining, strengthening and revitalizing the unique characteristics of Saint Paris. For more information you can find their facebook page at https://www.facebook.com/ourtown.saintparis.3. Submitted by Our Town St. Paris.